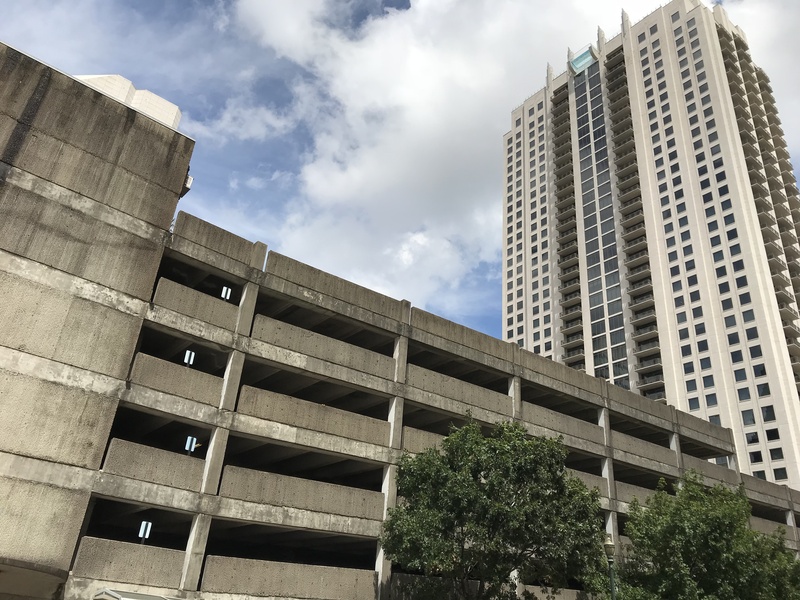 HOUSTON – (Realty News Report) – Hines is preparing to break ground on a 46-story residential tower on the site of the former Houston Chronicle parking garage. The 373-unit project – completion is slated for August 2021 – is designed by House + Partners, a Houston architecture firm. 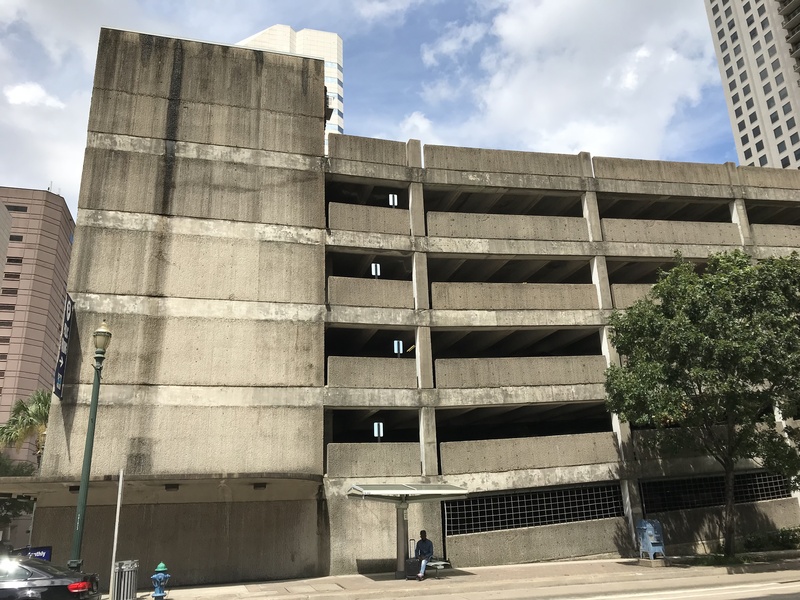 The old parking garage, which was used by Chronicle employees including this reporter for decades, covers a half block (about three-fourths of an acre) bounded by Preston, Milam & Prairie streets on Block 42. Realty News Report detailed the early plans for this Hines apartment last year, but the developer recently filed for permits. Catty-cornered from the apartment site, Hines, in partnership with Ivanhoe Cambridge, is developing a 47-story office tower on the site of the former Houston Chronicle building, 801 Texas. A Hines-led group bought the full-block Chronicle building and nearby half-block garage in 2015. The newspaper relocated its operations to the former Houston Post property on the Southwest Freeway near Loop 610. The new apartment tower on the old garage site will give Hines two apartment towers near Market Square Park. Hines recently completed another nearby downtown residential rental tower, the 32-story Aris Market Square Apartments building, which was designed by Ziegler Cooper. The new Hines apartment tower, 414 Milam, is expected to earn bragging rights as the tallest apartment building in town. The new project will be across the street from Woodbranch Investments’ 40-story Market Square Tower, which has a notable glass-bottomed swimming pool that extends ten feet over the roof of the building. Downtown Houston has added a number of residential properties in recent years. Camden Property Trust is now constructing a $140 million, 20-story, 275-unit residential tower downtown next to the Toyota Center in downtown. The Inner Loop area, including downtown, has been a popular location for residential towers, which provide a way to avoid commutes from the suburbs to employment centers such as Downtown, Uptown Houston and the Texas Medical Center. Hines is also developing a high-rise apartment tower on Montrose Boulevard, just south of Westheimer Road. Hines declined to comment about its new downtown project, which could be formally announced in the first quarter. The downtown residential development was aided by the city’s Downtown Living Initiative, which provided developers tax benefits of $15,000 per unit. But the program has been fully subscribed and it is no longer available. Some 3,000 downtown units have been built in recent years or are currently under construction.